Ernie Land’s 6th Amendment Strawman! – Kent Hovind v. Robert Baty – The Great Debates! 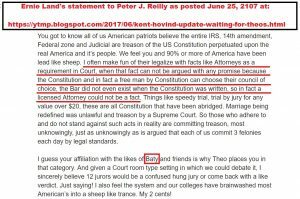 Home→Ernie Land’s 6th Amendment Strawman! Constitutional courts have a 6th Amendment obligation to allow defendants to have non-attorneys like Ernie Land represent them before the Court. Is the right to free speech absolute? Is the right religious practice absolute? Is the right to a free press absolute? Is the right to redress of grievances absolute? Is the right to bear arms absolute? It’s not that hard to understand, which raises questions as to what Ernie is up to with his years’ long promotion of the lie he continues to promote regarding the right to counsel. Is a defendant’s right to counsel absolute? Ernie Land, the answer is NO! You, Ernie Land, are wrong and you know or should know you are wrong! That the “Bar” as we know it today did not exist at the time the 6th Amendment was established is irrelevant to deciding the matter, Ernie, and you should know that! Why, Ernie Land, would you set up a strawman like that in support of your wrong-headed claim? The defendant, in such cases, is not the only one involved and not the only one on whom rights are bestowed. The courts, then and now, have rights, and one of the rights is to control who might be allowed to participate in proceedings brought before the court. Today, when there is a “Bar”, the courts have restricted practice before them, with a few exceptions, to members of the “Bar”. The Founders knew it then and we know it now. Ernie Land knows it, but he continues to tell his lie about it. SEC. 35. And be it further enacted, That in all courts of the United States, the parties may plead and manage their own causes personally or by assistance of such counsel or attorneys at law as by the rules of the said courts respectively shall be permitted to manage and conduct causes therein. The courts then could constitutionally limit the 6th Amendment rights of a defendant, and they can do it now, and they do. Ernie Land, you may be barred constitutionally from representing defendants before constitutional courts in this country. You know that I know that. bring forth works meet for such repentance! UPDATE: Another Exchange with Kent’s Ernie Land! – “The 6th amendment says ‘assistance of counsel’. – mean a BAR licensed Attorney? he refuses to even try to refute it. of the law, facts and circumstances. It’s not about when the BAR began to existence in this country. Ernie has been explained this over and over and over again. The Court could control who practiced before it then. It can control who practices before it now. Ernie also posted his announced, typical, cut and run, exit strategy.